When thinking of stories involving fairy godmothers, Cinderella probably comes to mind first. But how does a fairy godmother learn her trade? Author Jan Bozarth has her own ideas about fairy godmothers. In her book series, The Fairy Godmother Academy, all fairy-godmother's-in-the making must complete special quests and gain wisdom through specialized training through the Fairy Godmother Academy. Sometimes fairy-godmother's-in-training are just ordinary girls that don't even realize they possess special skills. Such is the case with a twelve-year-old girl named Birdie Cramer Bright. Birdie doesn't have a clue what lies in store for her when she visits Mo, her long-lost grandmother. Birdie's mother, Emma, doesn't get along her Grandma Mo at all and calls her a crazy old bat. But when Birdie finally meets her grandmother for the first time, she finds that they have many things in common. They both share a love of plants and can even name species by botanical (Latin) names. During her three day visit Birdie also discovers that she belongs to the Arbor Lineage of fairy-godmothers. After she stumbles upon an old book called "The Book of Dreams" she learns more about her lineage and enters a world called Aventurine. There she makes a new friend her age named Kerka and meets several mythical creatures including the Willowood Fairies. If Birdie intends to become a fairy godmother, the fate of the Arbor Lineage and all that is green lies in her hands. With Kerka's help, she must complete a quest to save the rotting Glimmer Tree and repair her broken family talisman, the Singing Stone. 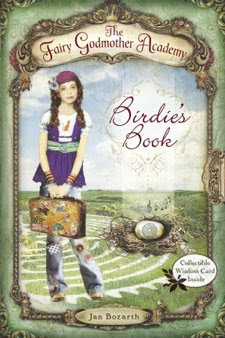 A cross between the Disney Tinkerbell stories and Harry Potter, Birdie's Book is a imaginative fantasy for tween girls. Birdie goes on an magical adventure of self-discovery, learns about responsibility and tries to encourage reconciliation between her mother and grandmother. I enjoyed the intergenerational aspect of the book (perfect for mother/daughter bookclubs), the use of a family tree and the Latin phrases sprinkled throughout the book. Scrapbook style images of birds, flowers and other objects add interest to the book, sometimes appearing as faded pictures under the text. Birdie is a highly likeable character and she makes interesting observations, comparing people to flowers (her mom is like a calla lily and her grandmother, a tiger lily). Birdie's Book releases on August 25, 2009 and is the first book in The Fairy Godmother Academy series. The series also includes a multimedia component featuring a website and trading cards. Readers can experience the dream world of Aventurine by visiting the corresponding online website and Fairy Godmother Academy social network at http://www.fairygodmotheracademy.com. Register to win a Hello Dreamer party kit at http://www.giaheadquarters.com or win one right here at Brimful Curiosities! To enter, leave any comment relevant to this post or let me know what special talent or wisdom would you like to have if you were a fairy godmother. This looks so good! If I were a fairy godmother I would like to have the talent to guide people toward what would really make them happy. If I were a fairy godmother, I would like to be able to tell the future to make sure that I am not making mistakes with my wishes. If I had fairy godmother powers I would a super encourager. I always tell my kids they can always try to do things, even if it seems impossible. I would love to be able to take away all my kids problems...at least for one day! I would have the power to grant wishes. This is a fabulous giveaway. If I were a fairy godmother, I'd love to be able to speed up time to show people how things would turn out, then bring them back to the present and let them make wise decisions. I would love to have the talent to make sick people well! I would like to offer you the opportunity to check out a new fantasy book, "Gatdeway to DreamWorld" which has received rave reviews. I would really like to have the ability to figure out why my 30 year old daughter is so mad at me. I can't stand the language that she uses when she talks to me. It just shouldn't be that way between a mother and a daughter. I'd like to have the wisdom on how to obtain peace, humility, and patience for all. I would like to be able to tell people what they are sick with and then be able to tell them what they must do to get cured from the sickness. If I were a fairy godmother, among many things, I would like to be able to help girls help themselves to follow their dreams. Whether that means the magic of patience, perseverence or luck! I would love to win this for my sister, I think she would enjoy it. Don't we all wish we had a fairy godmother? A fairygodmother who can taken emotional or physical pain away! If I was a fairy godmother I would want to make it so that the world is a safer place for our children!! I'm intrigued by this book since my daughter is 11; and a big fan of Harry Potter and epics of any kind! I would like to invite you and your daughter to read my new fantasy novel, "Gateway to DreamWorld." It has received rave reviews and has a shot at becoming a movie. As Fairy Godmother, I would want to be able to grant students a glance at what their live could be like if they applied themselves and used education as a means to get ahead in this world. I would also like to be able to show them what their future would be like if they didn't. Hopefully, I can help them become readers by sharing good books with them. Unfortunately, that's all the power I have. The good news is, that for some it works. I have now subscribed to "Full to the Brim" on Google Reader. I wish I could make everyone be nice and helpful to each another and try to make this world a better place. I'd like to be able to help people figure out what would really make them happy! If I were a Fairy Godmother, I would bring good health to all children. Thanks for the giveaway! I would love to be able to grant wishes to children in need, that would be wonderful! I would like to have the talent of granting wishes to myself or others.